Under Switzerland’s strict privacy laws, the media are barred from publishing the names of defendants or convicted criminals, with few exceptions. As a result, from the moment the killer was arrested, the Swiss press referred to the killer as B.V. (his initials) or at the most by using his first name only. Swiss journalists nonetheless made reference to the killer’s background, using terms such as Der Galerist (gallery owner), Galeristsohn (son of the gallery owner) and Kunsthändler (art dealer) amongst others. The Blick used the term «Goldküsten-Killer» (Goldcoast Killer) once. 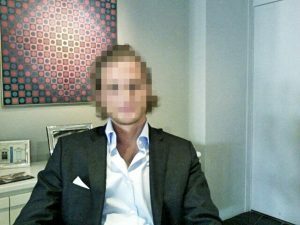 Basically, Swiss law does not allow for the publication of a defendant’s or victim’s name and all photos must be pixelated. Newspapers can nonetheless publish an artist’s impression of the defendant during the trial. They can also photograph and publish pictures of the exterior of the crime scene, in this particular case the outside of the villa where Alex was killed. Unlike their Swiss counterparts, almost all international media took a more robust view. However, some international newspapers, such as the Daily Mail and The Telegraph, wary of falling foul of the Defendant’s third lawyer who specialized in communications and media law, used geo-blocking. In this way, they circumvented the legal problem. Geo-blocking restricts access to internet articles depending on the user’s geographical location (in this case Switzerland). This meant that readers outside of Switzerland were able to view online articles with full names and photos of all involved and descriptions of the killer. Whereas readers in Switzerland were redirected to ‘error‘, ‘access denied’ or ‘Page not found’ on their screens. The Swiss press picked up on the fact that the British newspapers were covering the trial in detail, with names of all concerned plus photos. A story within a story. The Tages Anzeiger stated “So ist plötzlich niemand mehr anonym” (Suddenly, No One Is Anonymous Anymore). This meant that anyone in German-speaking Switzerland, who really wanted to know who the killer and victim were, now knew where to look. By the following week, the story of Alex’s brutal killing had reached the rest of the world. It was covered by journalists in Mexico, Japan, Georgia, Hungary, USA, Indonesia, and Greece, amongst others. Below you will find articles relating to the case. Articles are listed in chronological order, first those published in German, then English, and finally Spanish and other languages. This list represents a selection of the articles published. Depending on the reader’s geographical location, some articles may be geo-blocked for legal reasons. So brutal tötete Bennet S. (32) seinen Kollegen A.M.
Tötung im Villenviertel: Waren es wirklich die Drogen?